It really is the most wonderful time of the year, but if, like me, you have left the last of your Christmas shopping to the latest moment it can also become a tad bit stressful! It’s at this point that I’m always grateful for 21st century technology and in particular, the internet, because without a bit of online shopping Christmas would well and truly be cancelled in the Dewey-Love household this year. Usually one to fall prey to temptation from Amazon, ASOS et al, this year I decided to make a conscious effort to try and shop with some independent brands too. Now for tech and gadgets I am more likely to choose a larger retailer, but for more personal presents I’m all about supporting small businesses! In my three (almost four *gulp*) years of blogging, I’ve been lucky enough to make friends with some very very talented individuals who run their own incredibly creative businesses and it’s some of these gals I want to share with you today. I stumbled across This Sweet Year at London Edge in September, and boy am I glad I did! After leaving my business card with them, I was thrilled to find a message land in my Insta inbox a few weeks later asking if I wanted to receive some of the collection to style! Sarah is SO incredibly talented, and designs and stitches all her items herself. I was immediately drawn to the hilarious slogans and incredibly on point designs – if you’re looking for a present for a quirky individual, look no further cos I’ve got you covered! You can check out her amazing items on ASOS Marketplace here. After talking to the beautiful Jess online for years, I was thrilled to finally meet her in person at the Bloggers Blog Awards earlier in the year! Jess is such a wonderfully creative individual, and her work absolutely fills me with awe. Her Etsy shop, Witch Crafts, is full of original artworks and amazing t-shirts, perfect for that alternative guy or gal in your life! Check out her awesome shop here! I also met Katie at London Edge this year, having been drawn to her stand by the amazing and hilarious colourful Harry Potter prints – anyone who knows me well will know how obsessed I truly am with all things Potter. Katie’s work is so individual and creative – she blends amazing illustration with hilarious concepts (current favourites being Snapes on a Plane, Tom Lidl and Poledemort) and I’ve bought quite a few Christmas presents from her this year! Even if your Christmas shopping is now complete, I would still highly recommend checking her out on Instagram for her hilarious daily illustrations alone! Check out her shop here! I think one of the first bloggers I spoke to, Lauren is an amazing individual. Not only does she run a fantastic blog, this year she began her own illustration company with her work shooting to success and landing her in the pages of major magazines this year! I’m so so proud of her for everything she has achieved, and I can’t wait to see what she comes up with next year! You can buy her full range of prints here. Emma is another alternative babe I’ve spoken to online for years but only met in person recently! Having been a fan of her blog since I started my own, I was thrilled and also incredibly excited to hear that she had begun her own business selling the most beautiful hand illustrated cards. These are not just any cards though – she’s illustrated each one using dot work which is just incredible! This technique requires so much skill, dedication and patience and it looks absolutely amazing! Check out her shop here. Last but most certainly not least, is the gorgeous Jemma of Dorkface. Now if you don’t know Jemma, I’m not entirely sure where you’ve been for the past few years… Jemma is a much loved figure among the UK blogging community. 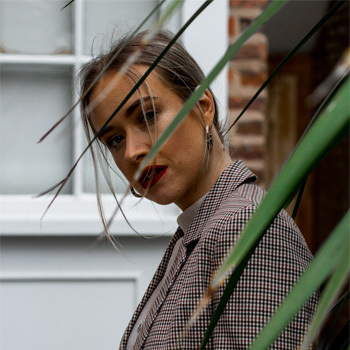 Building a hugely supportive community on Twitter, Jemma has singlehandedly brought the UK blogging world together via her Girl Gang while at the same time creating the most amazing and colourful pieces of art! Whether you’re after a motivational print, a new canvas on your wall, planner stickers or even a mug, Jemma’s got you covered! You can check out her store here. I really hope you guys have found this little independent shop guide useful – a purchase from their shops makes a huge difference to them, and it’s so important to make sure we’re supporting the smaller businesses this Christmas too!